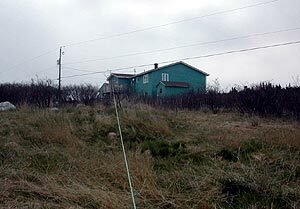 My first visit to the Round Cove B&B in Cappahayden, Newfoundland, had been in July of 2003. July is generally the worst time of year to DX in Newfoundland, so I was hoping for much better conditions on this trip. The venue is not as good as our old site, a few kilometres south, since there is less room for really long antennas and the antennas must pass under the power lines. (See the picture.) Nevertheless, I was able to deploy a 350 m antenna towards Europe, and another towards Brazil and southern Africa 550 metres long. Extending the latter was tiring work through extremely dense forest. DX conditions were never impressive, although there were some fair moments. When the antennas were finally in place, around 2330 UTC on May 6th, I checked the antennas and receivers (Drake R-8A and a Sony 2010 for back-up) by tuning to Radio Sawa from Djibouti on 1431 kHz. Reception was pretty good: SINPO 54544! 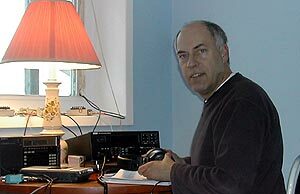 One of my main goals on the DXpedition was to log some of the new European stations that had come on the air in the past year. The only one of these that was unequivocally identified was Superloustic from France on 999 kHz. This was present, although usually hideously QRMed by Spain, every evening. I was surprised one evening to hear Glenn Hauser's distinctive voice on 1584 kHz, which ended up being a "first" log of Studio X from Italy. British local stations were present on many frequencies, but there are not many "new" targets left. I logged the newly renamed Easy Radio London on 1035 kHz, but all the others were re-loggings. African signals, with the exception of very common stations like Mauritania, Guinea, and VOA São Tomé, were absent. The action towards Brazil was also very modest, in spite of the large amount of time I spent digging for Brazilians. It is true that 15 to 20 ZY big-guns were easily audible every night, but the smaller stations were generally mute. Papacaça AM on 1470 kHz was the only "new" station logged. Argentina, Uruguay and Paraguay, which are some of my favorite DX targets, offered only their most commonly heard stations. By and large we treat North American stations as QRM, but occasionally an unusual one grows muscles and forces me to log it. For instance, very early one morning WVRQ in Viroqua, Wisconsin, (1360 kHz) decided it had to be heard over WKAT and WDRC, both of which were in the beam of the antenna. Like much of Newfoundland, the scenery around Cappahayden is both desolate and impressive. This is real wilderness. In the afternoons I enjoyed hiking on the East Coast Trail along the edge of the Atlantic. I never met any other hikers, since May is early for tourists, and most weekend outdoorsmen from the urban centre of St. John's need not come this far for a stroll in the woods. I saw a couple of icebergs far from shore, but I was told that there had not been many this Spring. I must thank my wonderful hosts at the Round Cove Bed & Breakfast, Ollie and Ken Perry. They made me feel at home, or maybe more than at home! They insisted that, although their place is nominally a bed and breakfast, I required three large, cooked meals every day. I ate far too much, and I needed the walks. In terms of DX, it was not one of the more exciting visits to Cappahayden. On the other hand, all but the most banal catches from Cappahayden are far beyond what I can hope to hear at home in Nova Scotia. I appreciated the opportunity to be in a spot where prime DX can at least be expected.